Established version for use in sports, research and advanced users. Dynamic measurement of ground reaction forces forces with respect to spatial resolution. Easy to use and to instruct, fast application and at the same time high reproducibility due to the utilised everyday motions. Applicable in any age group (reference data from 3 to 99 years included). Typical measurement duration about 1 minute per test (about 5 minutes for standard functional assessment).The test procedures include different jumps for the analysis of individual anaerobic peak power, maximum voluntary muscular force and movement asymmetries. The well established chair rising test enables fall risk analysis in geriatrics. Various balance tests are supported. The split platform allows a quantification of asymmetries of physiological movements. 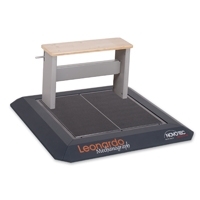 Included in delivery are the measurement platform Leonardo Mechanograph GRFP STD, the frame and the analysis software Leonardo Mechanography RES. Optionally available is a measurement PC or laptop with software preinstalled.